We enable our customers to deliver a more digital & connected experience. 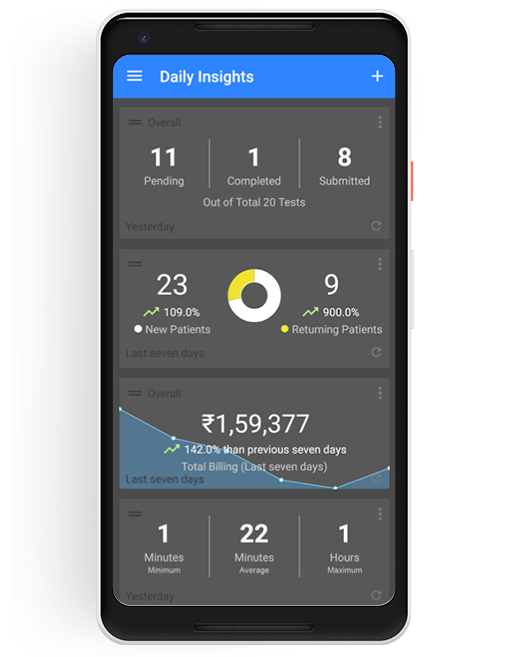 Learn how 1200+ labs & diagnostics centres use LiveHealth to deliver more value to patients, doctors & organisations. Offer seamless patient experience - from booking home collections to receiving reports and making payments through the app. With our integrated online payment system, allow patients to make payments from the app and check reports right when they're ready. Provide your patients an option to submit feedback right on the app. We've delivered over 200k patient feedback to our customers so far. Our mobile apps & easy interface lets you stay connected with your business at all times. Reduce your TAT significantly with instant delivery of reports to your patients, doctors and organisations. Our mobile app & web interface lets you manage all your locations centrally, and monitor all activities real time. Enable your doctors to access patient data anytime, anywhere. Automating workflows helps you run error-free operations at scale, deliver quality experience while saving costs. Improve TAT, reduce errors & scale to larger volumes with machine interfacing. Have better control & audit every activity. Feedback from customers of different business sizes & modalities. After switching over to LiveHealth’s cloud based lab management solution, our team is now relieved from monthly physical data backups, internet virus threats and server contingency. We can now focus on our core laboratory operations. Most importantly, a very dedicated, adaptable, hardworking and ever improving team of software developers @ LiveHealth makes the user experience a sheer bliss. Software implementation was quick. Our process has become faster, more efficient. We can now track our day-to-day business, easily. LiveHealth’s online reporting and Mobile App has increased the number of referrals and patients coming to our labs. Patients are thankful to our organization for keeping their medical records in place and this is just because of LiveHealth. LiveHealth not only helps us to monitor and analyse our TAT effectively, but we can reduce it considerably. Ours is an automated lab with all our equipment integrated with LiveHealth LIS, in a seamless way. LiveHealth's mobile app for doctors helps me monitor my lab remotely, at my finger tips. I can track the status of the workload in realtime and refer previous reports of my patients. 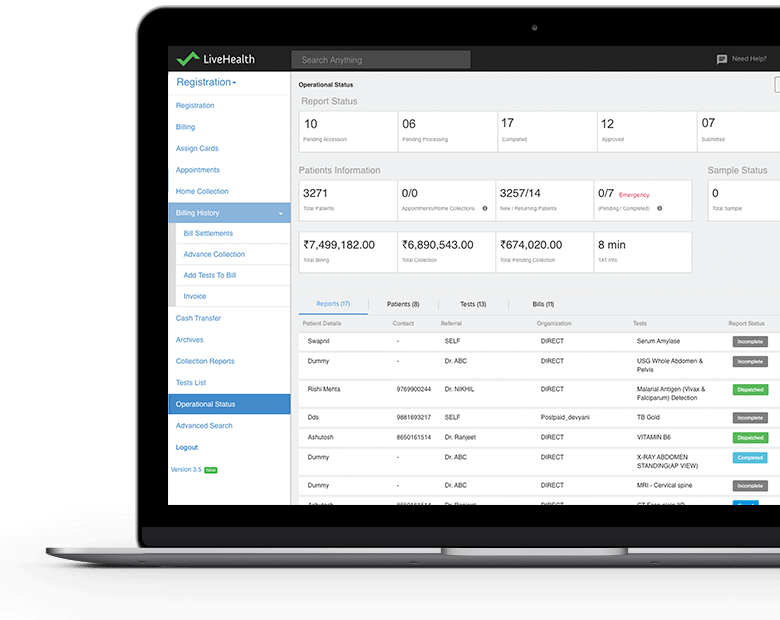 Switching the entire operations to a whole new platform is always painful, but the training and prompt support by LiveHealth team made it simple. We are very satisfied with their services and highly recommend this laboratory information software. Switching the entire operations to a whole new platform is always painful, but the training and prompt support by LiveHealth team made it simple. We are very satisfied with their services and highly recommend this software. Complete medical history, automated health trackers, online payments and personal health insights. Complete ERP solution with medical and lab workflow, instrument interfacing, multi-location management and much more. Complete employee health and wellness management. 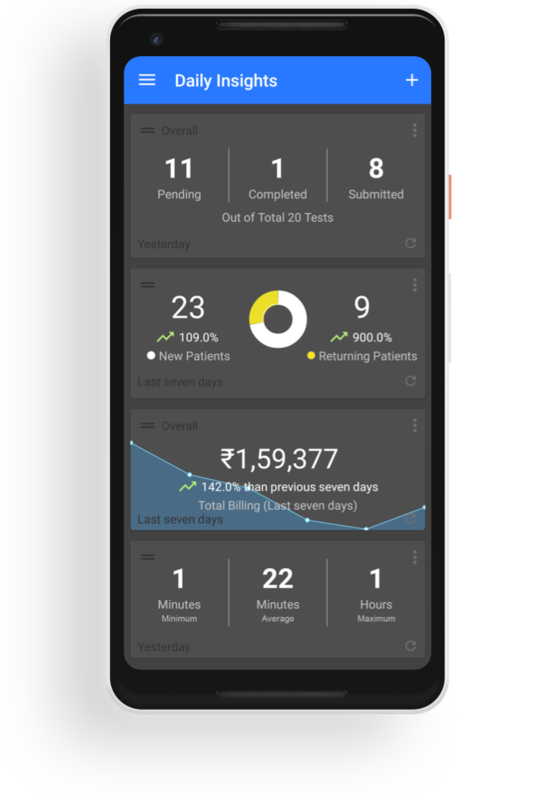 Get employee checkups done from hundreds of providers across India.